Smart, efficient organization can improve any space in your house—even the laundry room! With our custom solutions, you can turn your laundry area into a space that looks clean and tidy, gives you more room to work, and simplifies your everyday tasks. A few thoughtful design ideas can make a big difference in the ease and function of your laundry room. Start with the tips below, and ask your professional designer how to plan a solution that fits your space and storage needs. Make room for detergents, stain removers, and fabric softeners near the washing machine. You may want to keep them on open shelves for quick access, while placing items you use less often behind closed doors. Discover extra storage space by expanding shelves or cabinets using tall storage units. A custom organization system can make room for keeping everyday items close at hand and extra bedding or seasonal items higher up on top shelves. Darks here, whites there. Consider adding deep, pull-out wire baskets to your laundry room so you have a convenient place to sort and store loads before you wash, keeping them up and off the floor. 4. Include the ironing board. 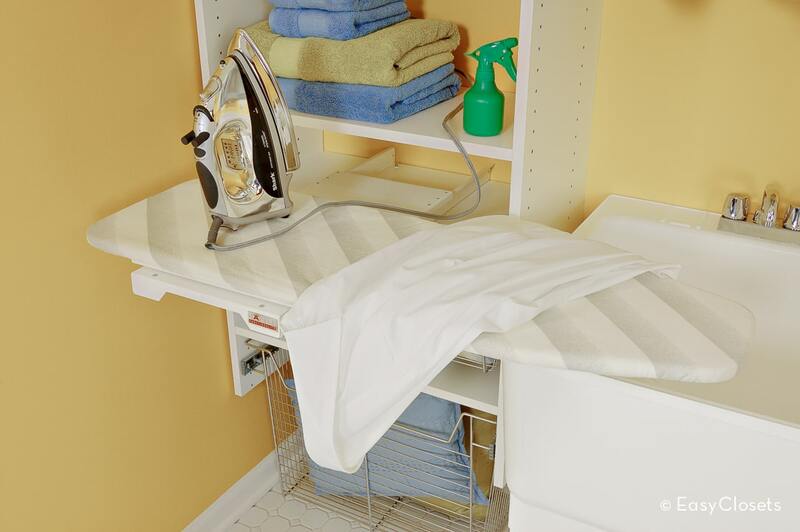 A compact fold-out ironing board is ready whenever you need it and easily folds up and out of the way when you don’t. It’s a space saver in the laundry room, but it can also be a handy extra for quick touch-ups in your bedroom closet. 5. Hook up your hangers. A built-in hanging rod offers a handy place to air-dry delicate items after they’re washed. Expand your hanging space even more with a slide-out valet rod where you can line up freshly ironed clothes on their way to the closet. Tired of folding and sorting clothes on top of your washer and dryer? 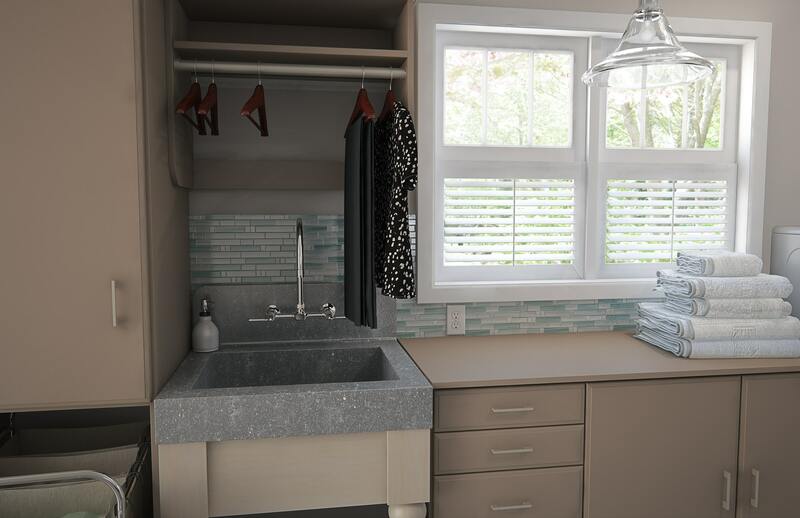 Make laundry day easier with a built-in countertop that gives you plenty of room to work. With simple DIY solutions that you can customize to fit your space and your needs, it’s easy to enhance your laundry room. For laundry storage design ideas, visit the gallery or contact your EasyClosets professional designer.